Roasted Gyokuro was another one of my free Frequent Steeper rewards. It’s one of DavidsTea’s pricier green teas, which meant that I really wanted to give it a try. I haven’t tried other gyokuro teas before, so bear with me. 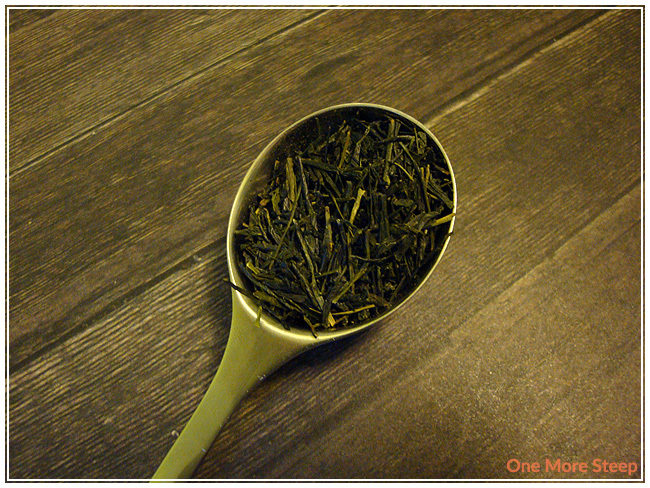 The dry tea leaves has a saltiness to the tea, the smell of it reminds me of the smell of grass and steamed spinach. It’s an interesting combination, but not so odd that it stops me from trying it. Roasted Gyokuro is made of organic green tea from Kagosima, Japan. DavidsTea recommends seeping in 80C water for 2-3 minutes. I steeped it closer to 2 minutes since I wanted to resteep it and increase the steeping time for each additional steep. 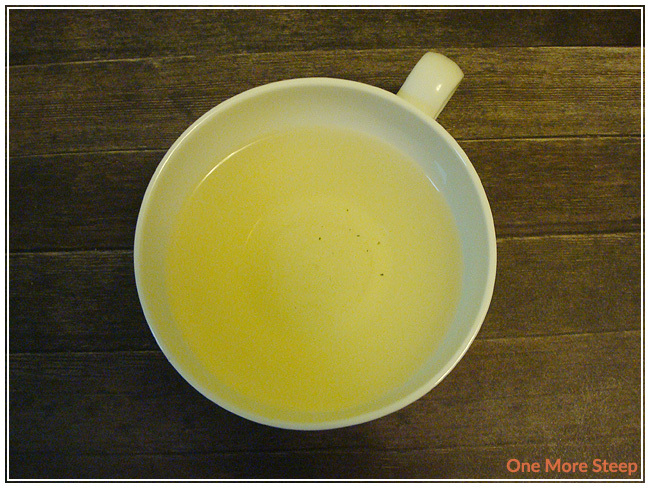 Roasted Gyokuro is a lovely pale yellow. It definitely has a fragrance that is unique to itself – it has a bit of saltiness, some grassy-spinach notes still. On first sip, I’m pleasantly surprised. There’s a bit of a buttery quality to the tea that mingles well with the grassy-spinach flavours. It does have a mild saltiness that I don’t find unpleasant. It adds to a different level of intrigue to the tea, which I quite enjoy because the flavour profile is different from the other green teas I’ve had in the past. 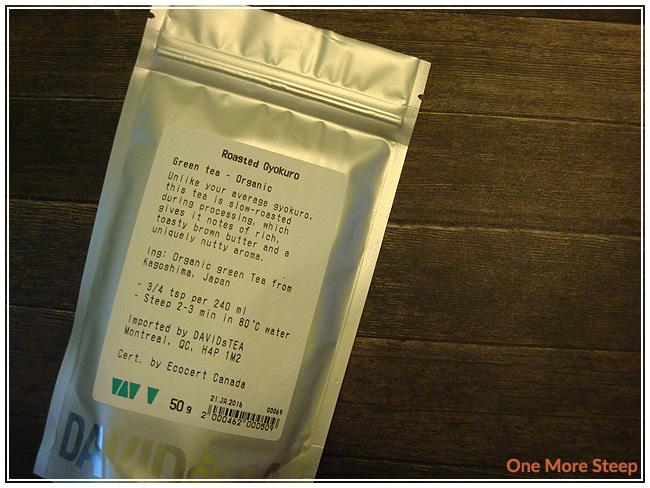 The description from DavidsTea suggests that Roasted Gyokuro has a brown butter flavour to it, with a nutty aroma. While I do get some of the butter, I can’t really pick out any of the nutty smell, but it still makes for a very nice cup of tea. When I steeped for just the two minutes, it made for a very pleasant cup of tea. It wasn’t bitter at all. I think 3 minutes would be pushing it and might result in a sad cup of tea. I would recommend steeping for the 2 minutes for the initial steep. Roasted Gyokuro resteeps well! The salty buttery-grass taste is a bit more pronounced with the second steep. It does fairly well for a third and fourth steep as well. It makes for a delicious pot of tea, I think it would pair well with sushi since it has that salty taste to it that would go well with fish. I liked DavidsTea’s Roasted Gyokuro. While I haven’t tried other gyokuro teas, I found this one to be tasty! It makes for a great cup of tea. The salty vegetal taste does lend itself to an enjoyable cup of tea, although I was a bit skeptical at first. there’s a lovely buttery taste to it. I wish I got some of that nutty aroma that DavidsTea mentioned in the tea’s description because I think that would have been a nice addition to the flavour profile of the gyokuro. As it is, it’s a great cup of tea, I just wish it had lived up a bit more to the expectations I had after reading the tea’s description. It resteeps well, so even though it is a bit on the more expensive side, it has great value from the amount of times that you can resteep it.